it's the year of the wolfe. Posted in Uncategorized on March 19, 2014 by socialwolfe. Businesses are past the point of wondering if they should be on social media. They know that having a Facebook page (and perhaps one or two other social media accounts) is necessary, but beyond that, many don’t have a clue how to get started, much less turn their social media efforts into a profit-generating activity. How do you get real, live, PAYING customers from your social media efforts? Is this even possible? My answer: most definitely! Here are my top tips on how to find prospects on social media and turn them into community members, paying customers and brand apostles. We all want social media followers who are actively using the internet, and social media specifically, to find products or services. One of the best ways to find potential customers or clients on social media is simply to use the social media site’s search function. Additionally, nearly all social media content management software has a search feature. Once you’ve found potential customers, you can answer questions they have asked, suggest products related to their search, or simply just follow them. If you already have a significant database of email subscribers, you’re in luck. Many email management services will allow you to access the publicly available social data of your email subscribers. If your email software doesn’t have this option, there are independent services that will allow you to upload a .csv list of your email subscribers, and find all public social media accounts associated with those emails. FanBase.com is one such company (I have no personal or financial relationship with the Company). This may seem obvious, but have you ever actually done it? Many business owners know to tell their customers how to find them on social media (‘Like us on Facebook’), but then neglect to ASK which social networking sites THEY use. For brick and mortar businesses, include a line on contest entry forms or feedback forms for customers to write links to their social media profiles. For online businesses, be sure to include a field on your contact form and email opt-in form. You can also ask your email subscribers where you can find them online: their website or blog urls as well as their social media profiles. Tip #4 – KNOW the Demographics of Various Social Networks. Another basic tip, but one that often gets neglected, is assuming Facebook and Twitter are the best sites for all businesses. I know you don’t have time to be active on all the major sites, so it’s critical that you know exactly where your target (read: paying) customers are. One way to do this is to understand the demographics of each network and make a conscious effort to focus your efforts strategically on the network with the greatest potential return. For instance, if your target market is educated women under the age of 50, Pinterest will be well worth your time. Teens and 20-somethings? You’ll likely have the best luck on Instagram. Do your research to determine where you target market is most likely to be, and find followers who are actually likely to buy your product or pay for your services. Finding your potential prospects on social media isn’t all that difficult. It just takes a little bit of time and ingenuity. Finding current and potential customers or clients who are likely to actually spend money with your company is a whole different thing. Hopefully, the tips I have shared with can help you do just that. Do you know where your customers are on social media? Do you feel like you understand who your target market is, and how you can connect with them on social media? Posted in Uncategorized on February 18, 2014 by socialwolfe. Posted in Uncategorized, Image format on February 9, 2014 by socialwolfe. Ads featuring puppies and babies typically guarantee buzz on Super Bowl Sunday. But offering cash works just as well, as online insurance company Esurance showed this weekend. The unit of Allstate Corp. was the most-tweeted brand of Super Bowl night, with a total of 1.9 million posts on Twitter, TWTR -0.22% according to Nielsen Co., despite the fact that Esurance didn’t buy an ad during the game broadcast. Instead, Esurance bought the ad slot appearing immediately after the game and used its time to offer $1.5 million to anyone who tweeted hashtag #EsuranceSave30. 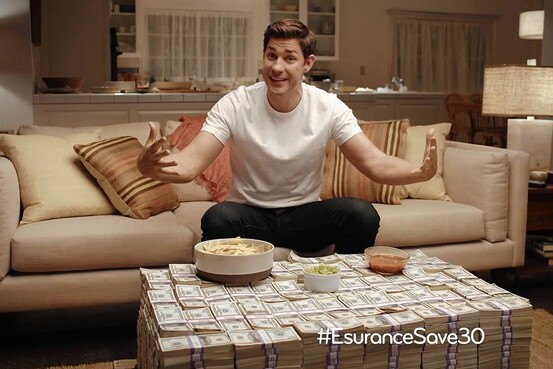 Its logic, as outlined by actor John Krasinski during the commercial, was that Esurance saved $1.5 million, or about 30%, by buying after the game, and its customers could look forward to similar savings. Advertisers that bought time during the game forked over roughly $4 million for 30-second spots. As of early Monday, Esurance says, 2.391 million tweets with the hashtag had appeared. The marketing arm of cloud-software company Salesforce, which had been tracking all the social-media conversations happening around the game, said that Esurance had the most-used brand hashtag of the Super Bowl. The game was watched by an average of 111.5 million viewers, according to Nielsen. That set a record for viewership of a U.S. television show, beating out the 2012 Super Bowl between the New England Patriots and the New York Giants. Viewership grew through the first half, and didn’t fall off significantly even as it turned into a blowout. The segment of the game from 9:30 p.m. EST onward earned a rating only 5% lower than the total game, according to broadcaster Fox. Posted in Uncategorized on February 4, 2014 by socialwolfe. 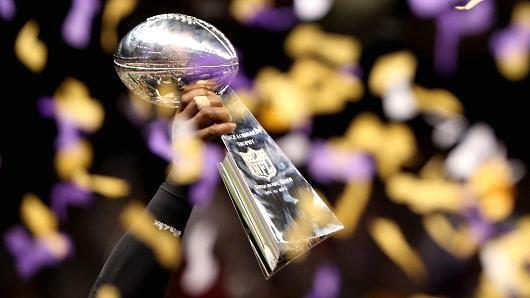 Super Bowl commercials are about to get a lot more social. For years, the ultimate American sporting event has served as a peerless venue for a parade of multimillion-dollar, 30-second bursts of branding. Until recently, you’d never know from watching the ads on air how relentlessly social advertising was spreading online. That changes this year. On Sunday, Super Bowl sponsors’ hashtags are going to be as ubiquitous as the hash marks on the field. For many marketers, the epiphany came during last year’s 34-minute Superdome power outage early in the third-quarter showdown between the San Francisco 49ers and the Baltimore Ravens. An alert marketing team promoting Nabisco’s Oreo cookies fired off an inspired, now-famous tweet to loyal fans of the iconic snack. The 43-character message was retweeted 10,000 times in the first hour, picking up 18,000 likes and 5,000 shares on Facebook. Jaguar’s effort will extend well beyond its pricey, 60-second TV spot. From kickoff to final score, a team of more than 30 staffers, outside social agency specialists and representatives from Twitter, Facebook, Google and other social outlets will be huddled in a control room, trolling social channels as they push Jaguar’s message to fans watching the game and talking online. Posted in Uncategorized on February 2, 2014 by socialwolfe. Posted in Uncategorized, Image format on January 29, 2014 by socialwolfe. Posted in Uncategorized on January 29, 2014 by socialwolfe.